I could hear the beat of within my chest, thump, thump, thump. Each one was louder than the talking in the room. My hands were sweating, my heart trembling, my lip gently quivered as I fought back the tears from rejection. “You are a paid singer. We don’t think you are worth the investment for a staff person position. We are looking for a man to be our worship leader” These words continued to echo in my head screaming at me. “You’re not good enough. You’ll never be enough” Then they politely asked, “How do you feel about this?” My response was not the finest of my moments. Unable to fight back the whelping tears just behind my eyes, I said, “excuse me” and left the room. You see I had just sat through a meeting where my character and calling were being pummeled by leadership who didn’t seem to understand or care about the pain they’d be afflicting on me for years. Now out in the hallway weeping with snot running down my face as I cried out to God for help. “Breathe in, breathe out. Breath in, breathe out”, as I coached myself on how to calm down. After I composed myself and timidly walked back into the room. I sat next to my husband with my head down. He quickly exclaimed, “we are done here”, grabbed my hand and led me out. That meeting affected me in a way I didn’t realize until I was met face to face with crippling fear from the rejection I’d been carrying. That day started me on a path I wish then I could escape. It led me to a complete breakdown. I went on the next few months afraid of virtually everything, including sleeping. I would wake up in a terror. I was afraid of being afraid. Needless to say after a few weeks of not sleeping God was graciously leading me to his feet where I could alone find peace. My husband had just taken a new job and I was traveling with him for a week. It was there afraid to be alone I ironically found myself alone for hours a day. This was the start of my new journey with Jesus. I went to the local Staples store in that town and bought an artist drawing pad and felt tip pens. I love the way the heavy paper feels under my hands. 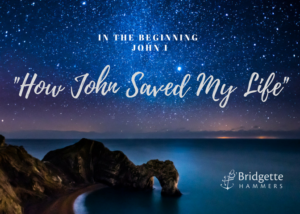 I began to dive into my only hope, where it was just me and Jesus…..and John. I asked God for guidance. I asked the Holy Spirit to bring light to his word. Little did I realize he would bring a new light as to who Jesus is. I walked outside the hotel room, sat on a rusty pool chair, and let the warm sun gently rest on my back. I opened the bible to John 1 and couldn’t get past the first verse. “In the beginning was the Word, and the Word was with God, and the Word was God. He was with God in the beginning” I began to think, the beginning? Then I flipped back to where it all started, Genesis 1. “In the beginning..” There’s that word again, “beginning”. God created the heavens and the earth. Now the earth was formless and empty, darkness was over the surface of the deep, and the Spirit of God was hovering over the waters. 1:2, “And God said, “Let there be light”. Jesus is the Word that was with God in the beginning. As I sat there in utter amazement of the intricity of who Jesus truly was, I paused. I reread Genesis with the knowledge that Jesus was the Word that was spoken. He was the Word that God spoke, “Let there be light”. I continued to read on in the creation story understanding that Jesus was the Word that was carrying forth creation. I may be a little out there, but this is what I believe God showed me about a deeper level of love from Jesus to the world. As I continued to read in John 1:10, “He was in the world, and though the world was made through him, the world did not recognize him, but his own did not receive him.” Bam!!!! Jesus was the the Word that came forth to create the world. He came to be in the world that was created by the Word that was him to save the world. He came knowing the world that was created by the Word that was him would reject him. What kind of love is this? As I sat there with a buzzing of a bee near my head, my sweet Izzy (our doggie) stared at me wondering why I was crying without any apparent reason. It was in that moment John opened up my heart to a new way to see the love of Jesus for me. I was falling in love with Jesus like never before. I remained there for what seemed like hours staring at the sun, marveling at the light that was created only by the Word that was my Jesus. Overcome by his love, for the first time in over a month I felt peace, indescribable peace. This kind of love did not create me with unique talents and abilities and passion to then label me unworthy or unable. I was not a mistake. I was not being overlooked by man, I was being protected by Jesus. In that moment he began to break down the strongholds that had held me physically captive for over a month. He began to free me from my personal prison in the shadow of his love. John’s words (which are actually Jesus the Word) were saving my life all over again. This is the start of how John saved my life. Bridgette Hammers is a worship leader songwriter out of Dallas, Texas. She and her husband joyful parent a furbaby named Izzy with the hopes of one day having their own children and adopting. You can find more blogs and music from her at www.bridgettehammers.com She is available for bookings to speak and lead worship.